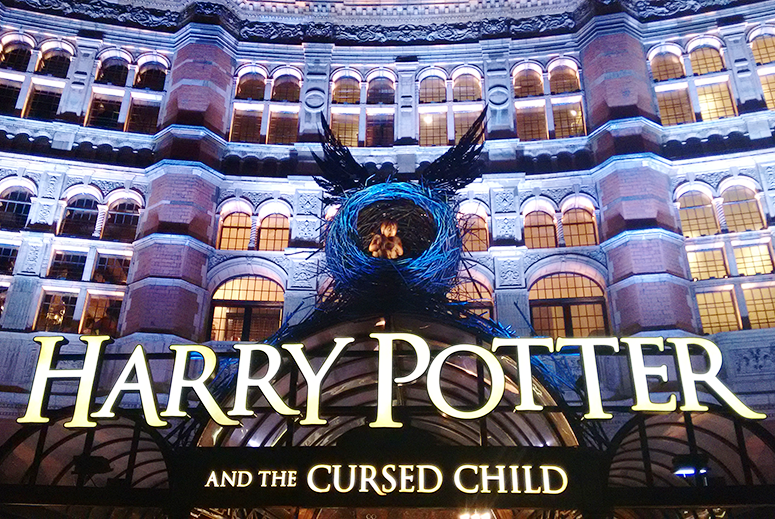 I wasn't certain that I was going to be able to see Harry Potter and the Cursed Child this decade. The theatrical continuation of arguably the biggest book franchise in history, has been so popular that not only tickets are completely sold out, but when the next batch will go on sale they will be for mid-2018! Luckily for me, the producers have set up the Friday Forty in which fans have the chance to win tickets to both parts of the play the following week for just £20 each (so £40 in total). While demand for that too was through the roof, after months of trying my friend was lucky a few weeks ago – and we got to see both parts of the play two Saturdays ago from the centre of the Stalls. It was a magical experience. 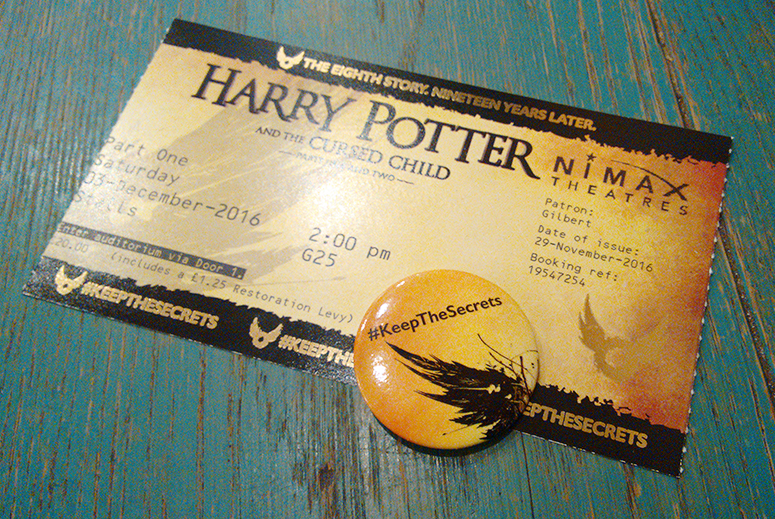 The theatrical Harry Potter continuation has been shrouded in mystery and they even have a dedicated hashtag #KeepTheSecrets, which is displayed on the tickets too, to try to keep the spoilers coming out from the plays to an absolute minimum, and so I won't talk on here about the story too much. This won't be a regular theatre review, instead it's more a stream of thoughts and feelings I had when I watched the play. The show has been split into two separate plays of two acts each, and while seeing them all in one day is very full on, it definitely added to the feeling of magic and wonder to immerse myself into this world for almost a full day. Personally, I much preferred the storyline and progression in part one, and I felt they could've edited the second part down to a single act. Despite this I also had the contradictory feeling of not wanting it to end because it was such a special experience being surrounded by the magic and excitement of Hogwarts in an intimate theatre space. The play kicks off during the epilogue in the final Harry Potter book and so takes place 19 years after the Battle of Hogwarts. What happened to our favourite trio since then? And what about the other characters we've grown to love (or hate)? The play fleetingly mentions some of our favourites and the core trio are a big part of it too. However, the focus of the story is very much on the next generation; Albus Severus Potter, Scorpius Malfoy, and Rose Granger-Weasley. I bet you can deduct whose kids they are, am I right? We journey with them as they discover so many of the things we loved from the books ourselves and even revisit some of the key moments in the series in unexpected ways. Most of all though, we get to see the effect that the Battle of Hogwarts, the rise to power of Voldemort, and all of the adventures from the original series have had on Harry, Ron and Hermione – and in turn on their children. It was a really fascinating insight and while I wasn't 100% convinced with where the trio ended up, in the context of this play it made perfect sense. What I loved most of all (though there wasn't nearly enough of it) was seeing how some of my favourite places and things from the wizarding world were depicted, and the magical way in which they made it happen in the confines of the theatre. There should've been more special effects, creatures and animals (they used to have live owls during previews and I'm gutted that they no longer do) to really get that fantastical element across, but in the moments they got it right, they really got it right (especially the in-between bits with a beautiful score and choreography, I properly felt like I was in a wizarding world during those moments). There was plenty of ooh-ing and aah-ing from the audience, including yours truly, during some of the most special surprises in the play. And I loved the new characters a lot. I might not have been feeling Hermione and Ron as much as I did in the books (in fact, I thought Rose was much more like the Hermione I remember and love) but Albus and Scorpius? Oh my god. Especially Scorpius ♥ I can't say how or why, but Anthony Boyle, the actor portraying him, is absolutely incredible. Harry Potter and the Cursed Child will run for years and years, but we will hear lots from him after that as well, I'm sure. Thank you so much for your kind words and best of luck in the Friday Forty!